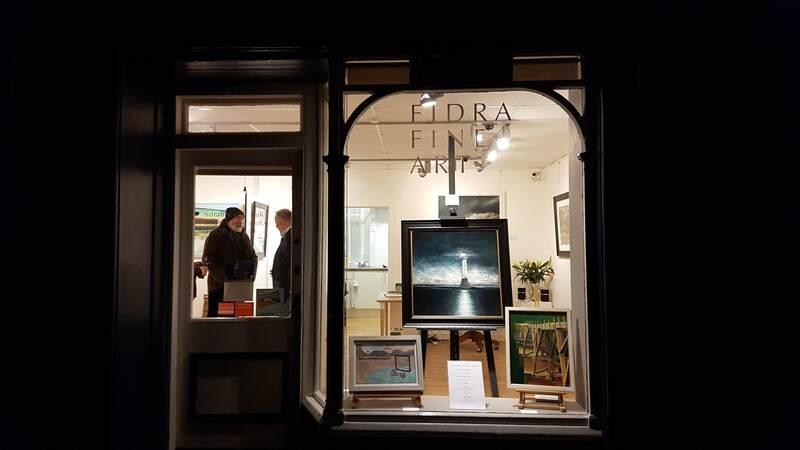 This month I’m showing some of my work alongside 5 of Scotland’s finest and best-loved landscape and architecture specialists in a show at the excellent Fidra Fine Art gallery in Gullane. 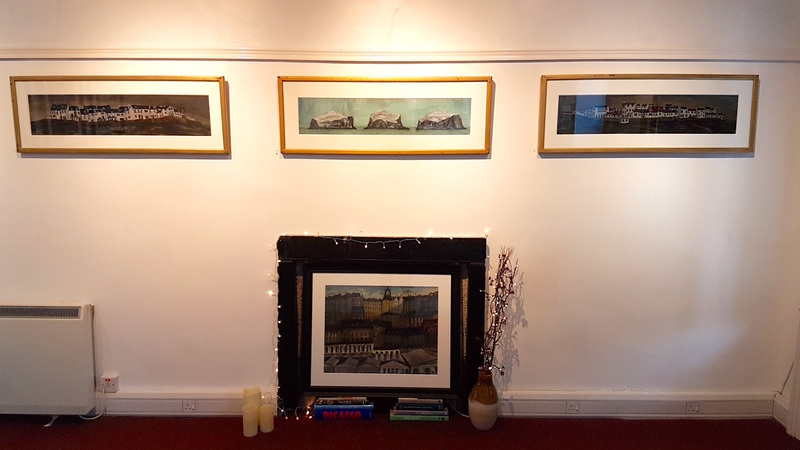 Along with the 6 paintings below (all of which have been recently completed and were done especially for this show), I will have a few of my etchings included in what looks to be a really interesting exhibition. The show opens at Fidra Fine Art in Gullane this Saturday 25th Feb. 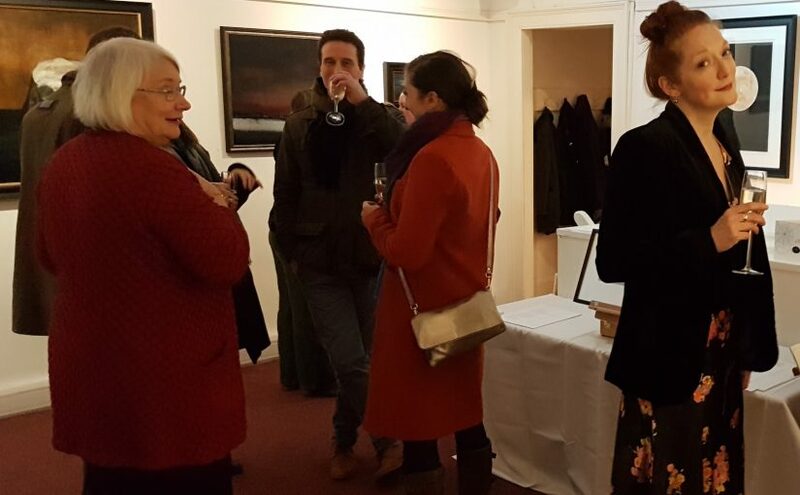 The other 5 artists taking part are George Birrell, Ann Cowan, Amy Dennis, Ann Oram and Allan J. Robertson. Though we’re all inspired by architecture, each of us has our own very distinct style and employ different creative techniques to create our work. So if you happen to be in East Lothian between 26th Jan and 24 Feb then go along for a look (closed Mondays). I’ll be at the preview night this Friday (6-8pm), as will some of the other artists showing, so I’ll maybe see you at that. This entry was posted in New Work and tagged Allan j Robertson, Amy Dennis, ann Cowan, Ann Oram, Art, artist, Bell Rock, Clive Ramage, Dean Village, east lothian, East Neuk, Edinburgh, Edinburgh art, Edinburgh Old Town, etching, etchings, exhibition, Fidra, Fidra fine art, Fife, fine art, George barrel, Gullane, landscape, landscape art, lighthouse, lighthouses, mixed media, Old Town, painting, print, printmaking, rsw, Scottish art, seascape, snow painting, st moans, watercolour on 23rd January 2019 by Clive. I’m very happy to have had the above etching hung at this year’s Society of Scottish Artists Annual Open Exhibition, which is being held at the RSA building on The Mound, Edinburgh. The show will run from 23rd Dec-17 Jan 2019. I’ve also had my work shown in 2 other prestigious annual exhibitions held at the RSA this year, the RSA and RSW. So it’s been a great year on that front, but I’m hoping 2019 will be my best yet. The new year will kick off with a show at Fidra Fine Art, Gullane, on the 25th of January, where 6 new paintings will be shown alongside works by 5 other artists who specialise in architectural landscapes, including my friend Ann Oram and some other artists I’ve yet to meet (George Birrell, Ann Cowan, Amy Dennis and Allan J Robertson). I’ve been working flat out on these pictures for the past few weeks and will post some of them here in due coarse. In the meantime, thank you to all those of you who have supported me and my work this year and every other so far with your purchases and with your encouragement! I hope you all have a wonderful Christmas and a very Happy New Year! This entry was posted in New Work and tagged atmospheric, Bass Rock, Ben Nevis, Clive Ramage, Dean Village, east lothian, East Neuk, Edinburgh, Edinburgh Art Fair, etching, etchings, exhibition, Fidra, Fidra fine art, Fife, fine art, Frames Gallery, Gallery Heinzel, Gullane, landscape, lighthouse, Marchmont Gallery, Morningside Gallery, North Face, pin mountain, printmaking, raw, RSA, Scotland, Scottish art, scottish mountain, Scottish society of artists, sea, seascape, Super Moon, watercolour on 21st December 2018 by Clive. 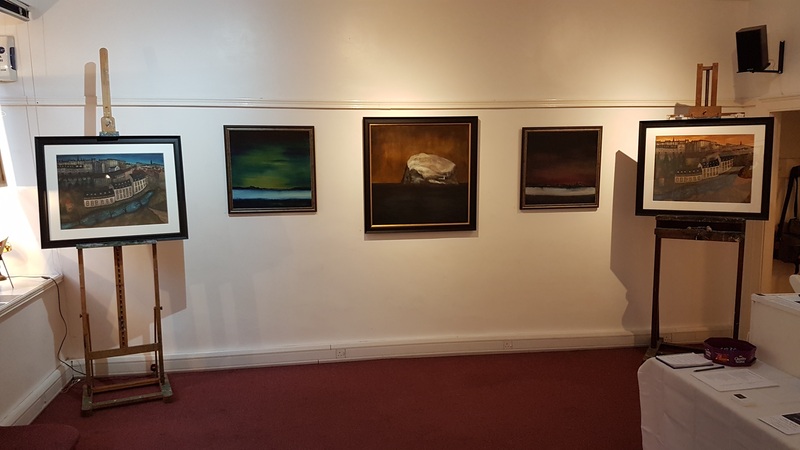 I wanted to share some photos from my recent solo show in Edinburgh for those who weren’t able to see it in person. There were 45 pieces hanging in total and it was the biggest collection on my work to be shown in one place to date. It was hugely beneficial for me in a creative sense to hang the show myself (well, with a lot of help from my friend Celie) as it gave me the opportunity to put the pieces together into groups that worked as mini collections on each wall. Every picture being part of a wider context. It took 2 solid days to hang the exhibition and I was glad to see that my combined output over the past 2 years or so also worked as a whole. This is something I have often wondered about (and I’m sure that’s the case for many other artists who work across a variety of media in relative isolation as I do). But the visitor feedback was also very positive in this sense, which helped to make the whole experience an absolute pleasure for me. Of course, selling several pieces and meeting lots of lovely people and hearing their thoughts was also wonderful. As a result, I’m really looking forward to putting together my next solo show in the coming year. This entry was posted in New Work and tagged Art, art sale, artist, atmospheric, Bass Rock, Cellardyke, Christmas, Clive Ramage, clive ramge art, colourful art, East Neuk, Edinburgh, Edinburgh art, Edinburgh Art Fair, etching, exhibition, Fife, fine art, Frames Gallery, Gallery, Heinzel, landscape, lighthouse, lighthouses, Marchmont Gallery, mixed media, Morningside, Morningside Gallery, printmaking, prints, Royal Scottish Academy, Scotland, Scottish art, scottish artists, seascape, Society of Scottish Artists, Super Moon on 14th December 2017 by Clive. Tuesday 28th Nov is last day of my solo show … that’s tomorrow! Tomorrow will be the last full day of my show at the Edinburgh Ski Club. It has been fantastic to have quite a large body of my work on show in one place again 2 years since my last solo. I’m glad to say the comments and feedback have been very positive from people who already know my work and the many who have come in out of the cold from the street to have a first look. So if you are able to come along tomorrow or before 2pm on Wednesday 29th November when I’ll begin to take it down then please do come in. This entry was posted in New Work and tagged Anstruther, Art, artist, atmospheric, Bass Rock, blue moon, Catterline, Cellardyke, Clive Ramage, East Neuk, Edinburgh, Edinburgh art, etching, Fife, fine art, Gallery, harvest moon, landscape, mixed media, painting, Scotland, Scottish art, seascape, Super Moon on 27th November 2017 by Clive. 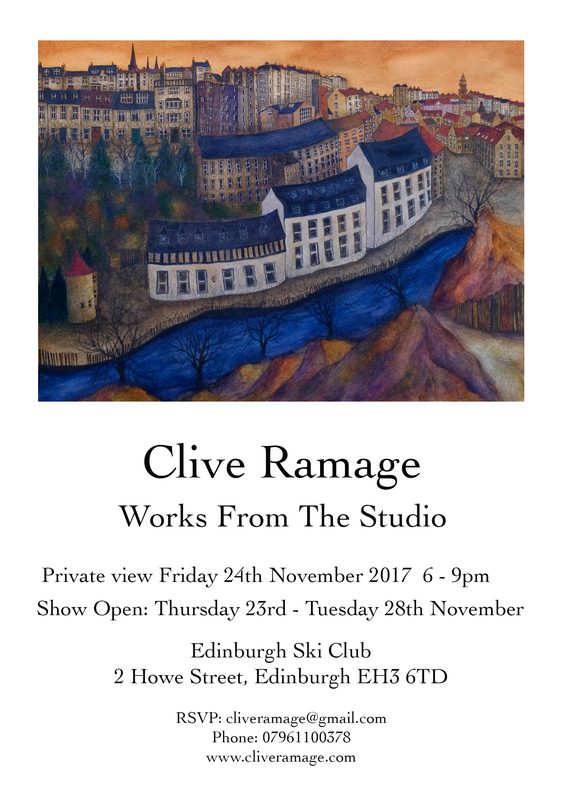 Clive Ramage will be exhibiting more that 50 works of art in a solo ‘pop-up’ exhibition at Edinburgh Ski Club this November. 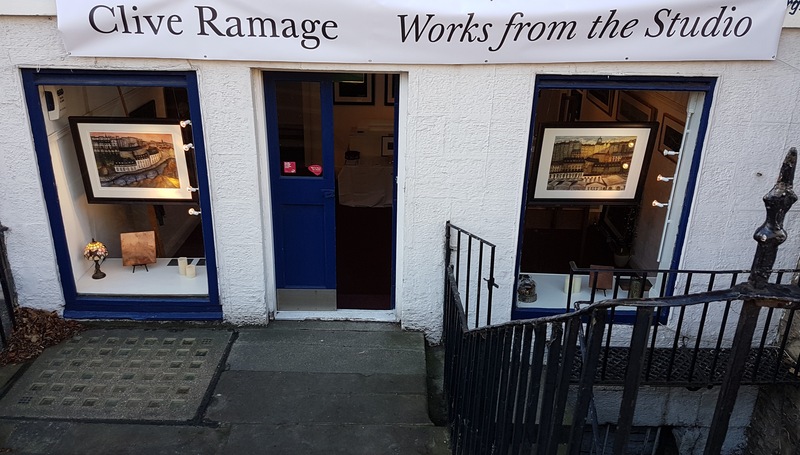 Works From The Studio is the latest solo show of works by Dunfermline-based painter and printmaker, Clive Ramage. 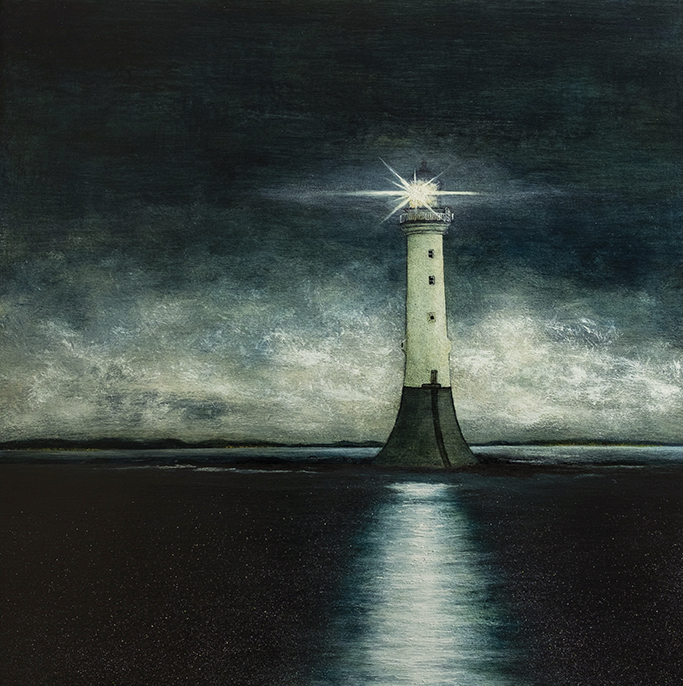 The show will include some of Clive’s atmospheric paintings of lighthouses, along with his popular Edinburgh and East Neuk scenes and a variety of hand-coloured etchings. This will be the biggest collection of Clive’s works to be shown in one place to date. Clive mainly works from his home-based studio in Dunfermline and is also a member of the Fife Dunfermline Printmakers Workshop. He frequently travels around Scotland in his camper van (or mobile studio) seeking inspiration in the country’s wild and remote corners and it’s often dramatic weather. Many of the paintings in this exhibition have been inspired by these trips along with Edinburgh and the villages of Fife’s coast. Clive exhibits regularly at the RSA, SSA, RGI and the RSW annual shows. 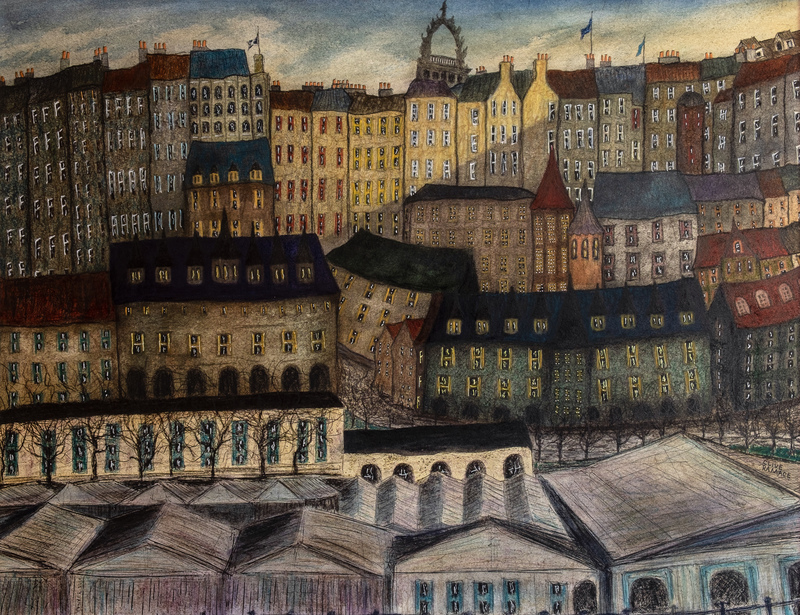 He frequently sells his work with many galleries around Scotland with his prints and paintings hanging in private collections around the world. This entry was posted in New Work and tagged Art, artist, Clive Ramage, Dean Village, Dunfermline, East Neuk, Edinburgh, etching, etchings, exhibition, Fife, Gallery Heinzel, Scottish art, seascape on 24th November 2017 by Clive. 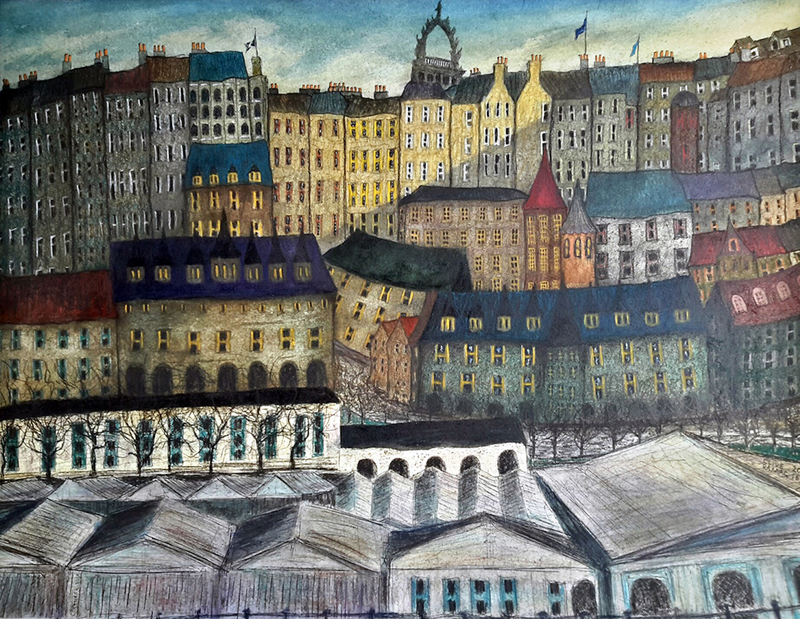 There will be a variety of recent watercolours, oil paintings and etchings on show. Proceeds from sales will go towards the costs of a 2 month residency at Castlemaine Press Print Workshop, Australia next year. Please join me at the private view. I look forward to seeing you there! This entry was posted in New Work and tagged Anstruther, Art, art edinburgh, art show, artist, Bass Rock, Castlemaine, Cellardyke, Clive Ramage, Dean Village, Dunfermline, East Neuk, Edinburgh, Edinburgh art, Edinburgh Art Fair, Edinburgh exhibition, edinburgh ski club, etching, exhibition, Fife, fine art, oil painting, printmaking, Scotland, Scottish art, seascape, solo show, Super Moon, watercolour on 6th November 2017 by Clive. It’s been a long time since I’ve posted anything, but it’s not because I haven’t been busy painting and printmaking. In fact, it’s probably because I have been so busy doing that that time has flown by. But as I’ll be taking part in a mixed show at Dancing Light Gallery in Whitmuir over the next few weeks, I thought I’d better get my act together on the marketing front! The gallery will be having a preview over this coming weekend and I have 10 pieces in the exhibition, including those above and below. If you’re in the area (it’s halfway between Edinburgh and Peebles) then the gallery is well worth a visit. As is the lovely restaurant and organic farm shop which are all together under the one roof. Here’s a link to the gallery for details of the exhibition and how to find it. This entry was posted in New Work and tagged Art, art gallery, artist, Clive Ramage, colourful art, Dancing Light Gallery, East Neuk, Edinburgh, Edinburgh art, Edinburgh Art Fair, Edinburgh Old Town, etching, exhibition, Fife, fife art, fine art, landscape, mixed media, organic farm, painting, Peebles, printmaking, Scotland, Scottish art, Scottish landscape art, seascapes, solo show, Tobermory, watercolour, Whitmuir organic on 1st November 2017 by Clive. 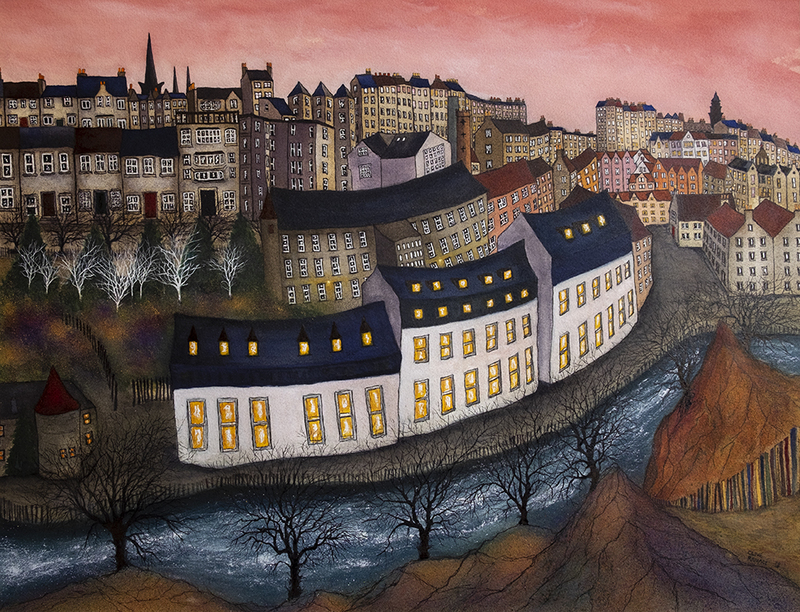 I’m delighted that my latest Dean Village hand-painted etching (Sunset) has been accepted to be exhibited at the Royal Scottish Academy Annual Open 2017. It’s the 4th in a series of 10, each of which depicts the scene at a different time of day or season. I’m especially pleased that this painting was accepted as I think it it’s the best piece of work I have done to date. It’s certainly the one I’m most satisfied with, insofar as it’s the closest I’ve gotten to achieving what I had in mind when I began the series last year. I’m also really pleased to have work in this particular RSA Open as it’s on during the Edinburgh Festival, so it’s going to be very busy. I won’t make it to the opening of the exhibition unfortunately, but I’ll look forward to seeing the exhibition when I return from my summer holiday. I’m off to Belgium and Holland to get up close and personal with all my favourite paintings by artists like Bosch, Brueghel, Avercamp, Rembrandt and Vermeer. I’m especially looking forward to going back to the Rijksmuseum which was mostly closed for refurbishment the last time I visited, so I only saw a fraction of the artworks they normally have on show. I’m currently reading the weighty Van Gogh, The Life tome and so this is also going to be a bit of an artistic pilgrimage to the places where he lived, worked and painted in those 2 countries. I’m hoping to come back brimming with ideas and inspiration and, despite the huge amount of anticipation I have for going on this trip, I’m already looking forward to getting back to work when I return. I’ll try and post a few pictures from my trip here and on my Instagram page, so watch this space. On another note, I just delivered a batch of etchings and paintings to The Coach House Gallery in Pittenweem, which will be on show there during the Pittenweem Art Festival. So drop in for a look if you’re planning a visit (which runs between 5-12th August). And if you haven’t been to Pittenweem or the festival before then it’s well worth the trip. The village is stunning and the interiors of some of the houses perched on the hill above the harbour are well worth a visit in their own right. There’s over 100 artists showing, as well as music and other events so there’s plenty to see and do. 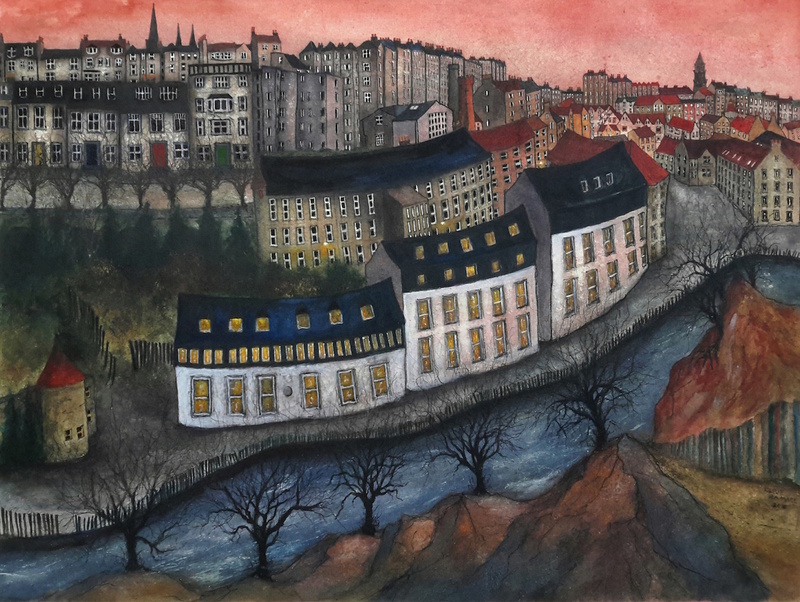 This entry was posted in New Work and tagged Art, artist, Avercamp, blue painting, Bosch, Brueghel, cityscape, Clive Ramage, Clive Ramage Art, Dean Village, Dean Village painting, East Neuk, Edinburgh, Edinburgh painting, Edinburgh scene, Edinburgh sunset, etching, etchings, exhibition, Fife, Fife artist, fine art, landscape art, mini painting, mixed media, open exhibition, pink painting, Pittenweem, Pittenweem arts festival, printmaking, prints, Rembrandt, Royal Scottish Academy, RSA, Scotland, Scottish art, sunset, Van Gogh, Vermeer on 15th July 2017 by Clive. Here’s a quick update on a few things that have happened recently and will be happening over the next few weeks. I have a few pieces in this show at the lovely Strathearn Gallery including these 2 above and below. It’s on until 21st May, so do drop in tomorrow for the opening or before the show closes in a month. 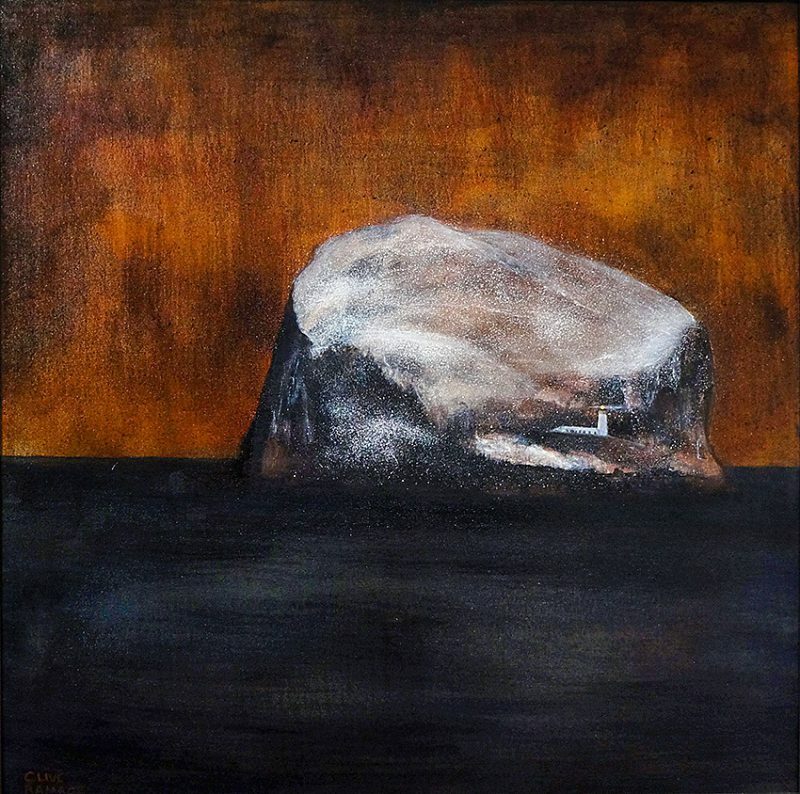 I also have new work on show at The Quay Gallery, Aberdour, including this large oil of The Bass Rock (a favourite subject!). The other news is that I have left Fire Station Creative and will no longer be taking part in exhibitions or open studios at there. I will, however, be opening my new studio doors (in Edinburgh) to the public at some point in the future, so keep an eye out for news on that front. Many thanks to those who visited the recent show at Gallery at Fifty Five in Stonehaven. 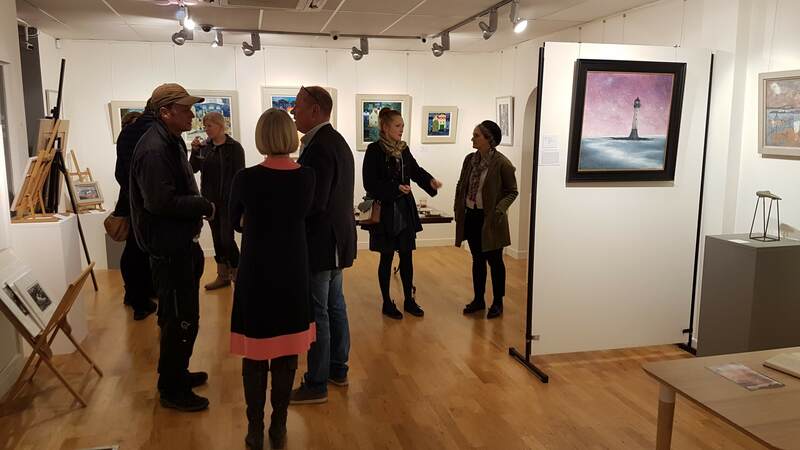 The feedback was fantastic and I look forward to exhibiting there again in 2018. 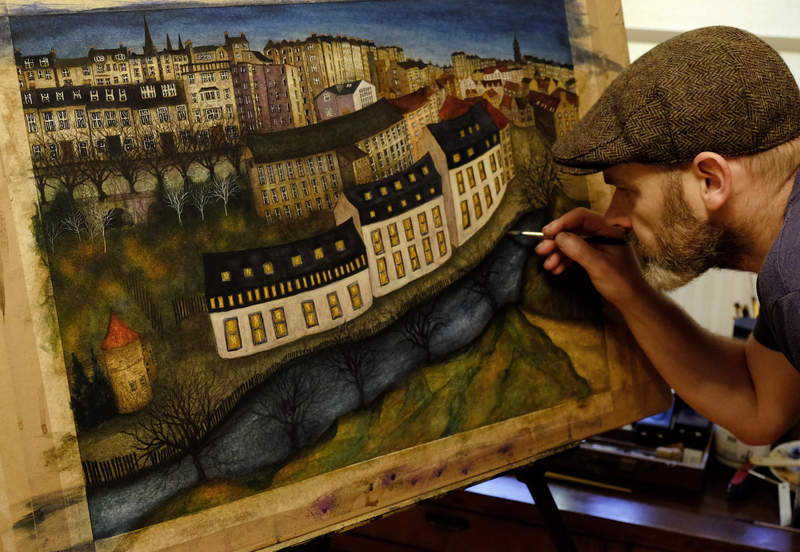 Until then, I’ll be working on new pieces including more versions of the 2 hand-painted etchings above and those I’ve done of Edinburgh and the East Neuk, along with more oils based on my recent travels to Yorkshire, Cornwall and Northumberland. 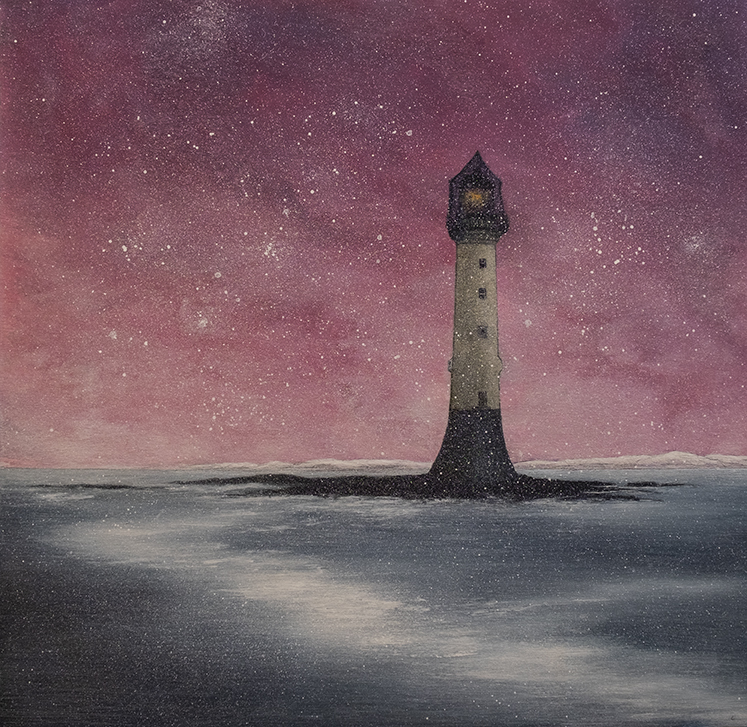 There will no doubt be a few more lighthouse paintings and new etchings in the pipeline too. There’s more to report as far as exhibitions coming up are concerned and an exciting piece of news (for me at east!) about my work featuring in a new glossy magazine … but I’ll leave that for next time. This entry was posted in New Work and tagged Art, artist, atmospheric, atomspheric, Bass Rock, boats, Clive Ramage, Cornwall, Crief, East Neuk, Edinburgh, Edinburgh Art Fair, etching, etchings, exhibition, Fife, fine art, Gallery, lighthouse, mini painting, Morningside, Morningside Gallery, north berwick, Northumberland, painting, print, printmaking, prints, Quay Gallery, Scotland, Scottish art, seascape, Strathearn Gallery, Tobermory on 21st April 2017 by Clive. Here’s some news about some upcoming exhibitions. 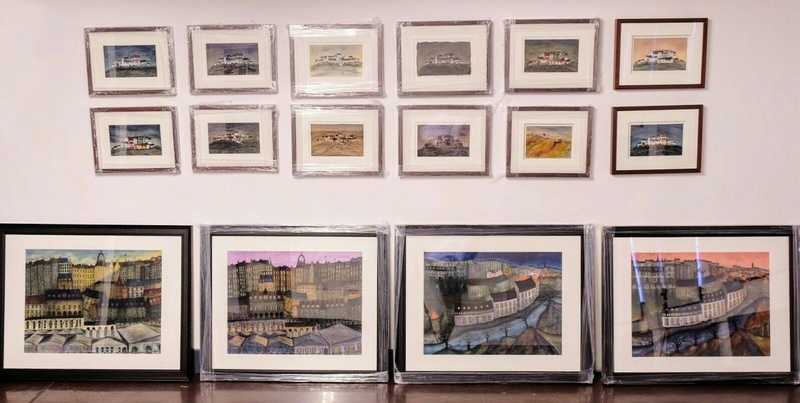 I’m happy to say I have a number of exhibitions in the pipeline for this year and this lot of newly framed work will be heading off to a gallery near you in the coming week. I’ll have some of this work in the Gallery at Fifty Five Spring show opening in Stonehaven on 4th March. There’s also arTay during Perth Festival of the Arts which takes place in May, and either side of that I’ll have work in the Pittenweem Arts & Galleries Weekend along with fellow Fire Station resident artists in April, and at the Fire Station Creative gallery which will be happening around Open Studios time in June. I’ll post the specifics for all of these nearer the times. In the meantime, I’ll be working mainly on new oil paintings and etchings, including lots based on my recent Cornwall, Devon and East Lothian trips in the campervan. This entry was posted in New Work and tagged Anstruther, Art, atmospheric, atomspheric, Catterline, Cellardyke, Clive Ramage, Cornwall, Devon, Dunfermline, East Fife, east lothian, East Neuk, Edinburgh, Edinburgh Art Fair, Edinburgh galleries, Edinburgh Old Town, etch, etching, etchings, exhibition, Fife, Fife galleries, fine art, Fire Station Creative, Frames Gallery, Gallery, gallery at fifty five, Gallery Heinzel, landscape, low tide, mini painting, mixed media, Morningside, Morningside Gallery, New Town, painting, print, printmaking, prints, Scotland, stonehaven on 21st February 2017 by Clive.